The animated science-fiction adventures seen in Rick and Morty are irreverent, shocking, and hilarious-from the cynical and rapid-fire one-liners to the grotesque and endearing character designs. 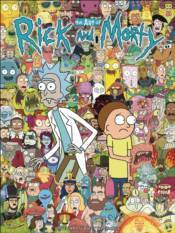 Now, take a deep transdimensional dive into the creation of these many insane universes with The Art of Rick and Morty! o Exclusive never-before-seen concept and production art from the making of the hit animated series!